Does the library meet your needs for technology services, including internet access and online information? 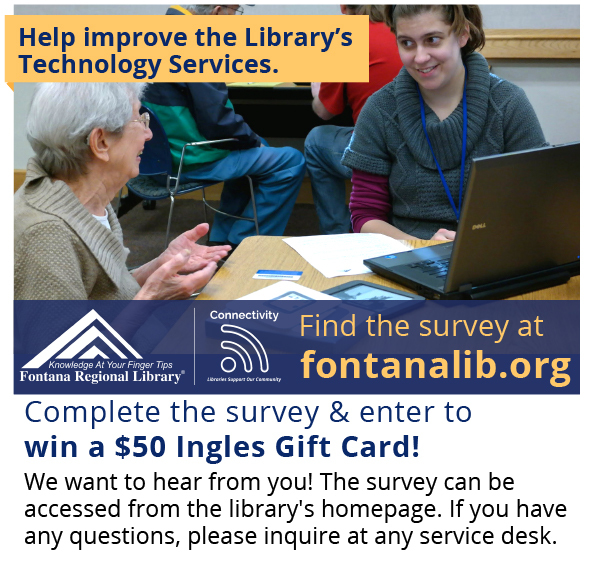 Fontana Regional Library is conducting a survey to find out how patrons use library technology and whether those services meet community needs. Called the Impact Survey, the questionnaire will open on August 6th and close on August 31st. The public’s responses will help libraries in Macon, Jackson, and Swain Counties improve their technology services and communicate the value of providing these services. The survey takes 10-15 minutes to complete, is completely anonymous, and is available in English and Spanish. To take the survey, drop by any public library in Macon, Jackson, or Swain counties or complete it online at impactsurvey.org. All members of the public are encouraged to make their voices heard, whether or not they use the library or have a library card. The Impact Survey is made available to public libraries nationwide and is the result of a research initiative from the University of Washington with support from the Bill & Melinda Gates Foundation.